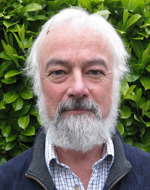 Wallace Arthur, author of Evolving Animals, continues his series of blog posts with an eye-opening new piece on the curious nature of the embryo and why that means time is an important factor to consider when thinking about what makes an animal an animal. 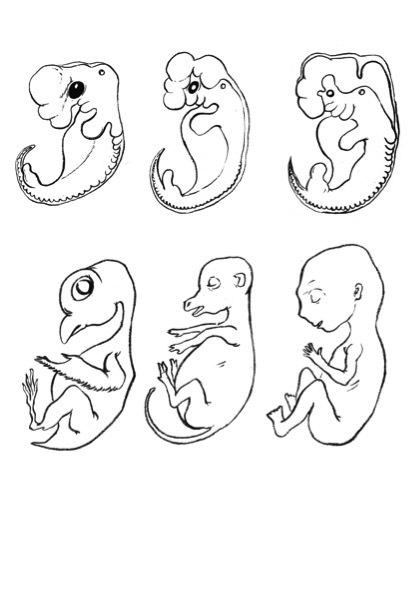 The connection between embryos and evolution – the nature of which was left hanging at the end of my last post (‘Where did your head come from?’) – can only be described as awesome. Can I do it justice in a just few words? We’ll see. It has been known for about 200 years that if you put early embryos belonging to different species of vertebrates – such as a human, a cow and a bird – into small glass bottles of preservative, one apiece, and you forget to label these bottles, when you come back to the lab next day you won’t be able to tell which is which. At that early stage in our development, we are all very similar-looking creatures (see picture), even though as adults we are incredibly different. So, if you were to sketch an evolutionary tree with pictures of early embryos, rather than adults, at the tips of the branches, it would look a bit weird because the message that would be drawn from it is that nothing much has happened over the long course of evolutionary time. Which, of course, is nonsense. To see what has really happened you have to change the way you think of animals. You have to picture them not as 3D objects like a lion or a butterfly, but rather as 4D entities whose time dimension is an integral part of their essence. Thus a lion is a line though time, one that starts as a single cell, becomes a lion embryo, which in turn becomes a cub, which grows into an adult. A butterfly is an even more dramatic line through time: who would imagine, on seeing a caterpillar for the first time and not knowing anything about it, that it’s a ‘butterfly cub’? The lion and the butterfly are examples of, respectively, so-called direct and indirect development, the latter involving a larval stage that looks nothing at all like the adult. From a developmental perspective, evolution is seen as a long-term process that causes deflection of the short-term process that we call development so that, although starting from a similar point, the embryo produces very different results. Or, to put it another way, evolution changes the end-point of development much more than it does the start-point. But why does evolution work in this way? 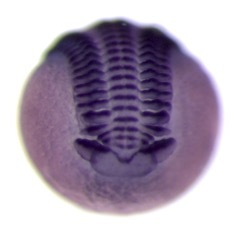 And another question just for fun: what animal will the ‘mystery embryo’ shown here as a colour image grow into?